We are the earliest company who start on air cushion packaging in China. We have our own technical team, design/develop new products, manufacturer the machine and consumable product by ourself. We have patent on all of our products. 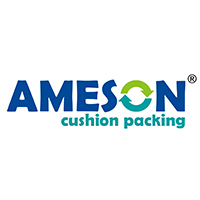 Established in 2006, Xiamen Ameson New Material Inc. is a professional manufacturer engaged in the research, development, production, sale and service of Air cushion machine,Air cushion film,Foam packaging machine, Dunnage bags, Air column bags etc, factory located in Xiamen, South of China which have convenient transportation access. Dedicated to strict quality control and thoughtful customer service, our experienced staff members are always available to discuss your requirements and ensure full customer satisfaction. In recent years, our company has introduced a series of advanced equipment. In addition, we have attained ISO9001:2008 certification. Selling well in all cities and provinces around China, our products are also exported to clients in such countries and regions as the USA, Germany, UK, Denmark, South Korea, France, Japan and so on. We also welcome OEM and ODM orders. Whether selecting a current product from our catalog or seeking engineering assistance for your application, you can talk to our customer service center about your sourcing requirements.